Here’s a new site. It’s a site to discuss paediatric anaesthesia. It’s not clear what it will look like yet. The aim is pretty simple though – share knowledge and stories related to perioperative care for kids so clever people can learn from clever people. So much of delivering evidence-based care is about the way the experienced clinician interprets the available evidence that any chance to discuss this stuff is valuable. The other important bit is experience. So often really great learning comes from a chat in a corridor with a colleague – learning from their experience or having new light shone on your practice. This site is for sharing tips about practice too. So that’s the introduction. The editorial group kicking it off is hoping to hear from those with an interest in kids’ anaesthesia from far and wide. Maybe even to hear how you do it – do you start with a song or a story? 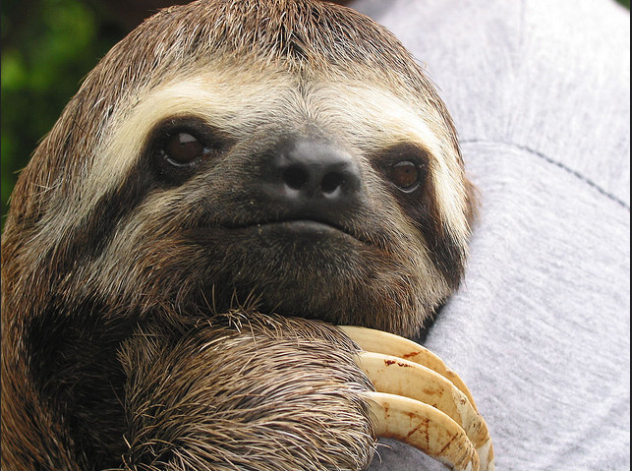 Here is a sloth who looks friendly but wait LOOK AT THOSE CLAWS!! This image is from the commons area of flickr.com and was posted by Carol Schaffer (no alterations were made to the image). Hi Cormac and thanks for getting in touch. Would you believe post 2 is going to be a whole post on practical tips for cannulation? I believe that is one of the tips in the draft.